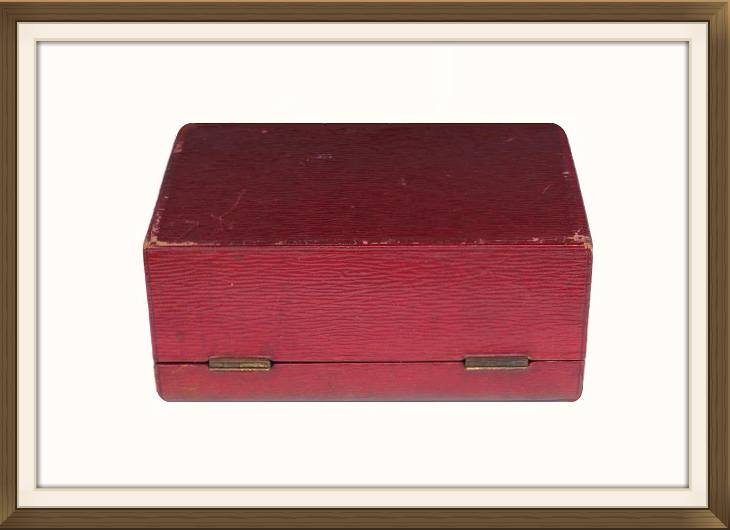 This is a beautiful antique jewellery box, dating to 1890/1900. It has a high quality, solid brass, British made lock, and a beautiful textured maroon red leather finish. The lid has a nicely inset, nickel plated handle, and a matching nickel plated keyhole escutcheon. The interior has its original lift out tray, with 3 front compartments and a rear ring section. It is complete with its original pull tabs and has a maroon leather finish which matches the exterior. The front compartments have padded silk bases, and the centre compartment is lined with velvet. 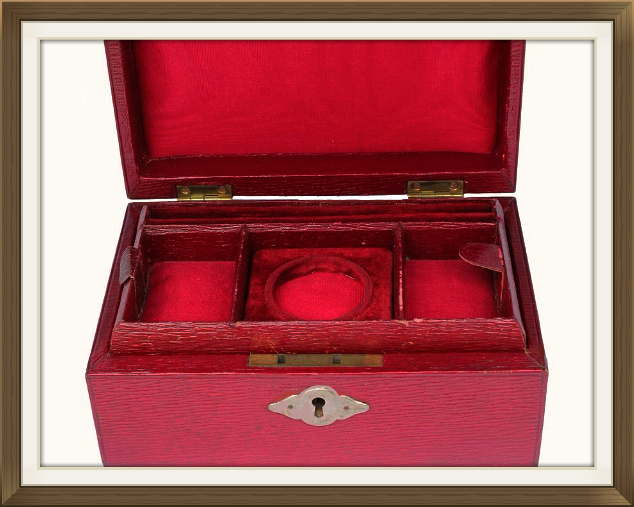 This compartment has a little raised tray, with a circular ring that was originally designed for a pocket watch. This can now hold a pendant or locket, or can be removed if not required. 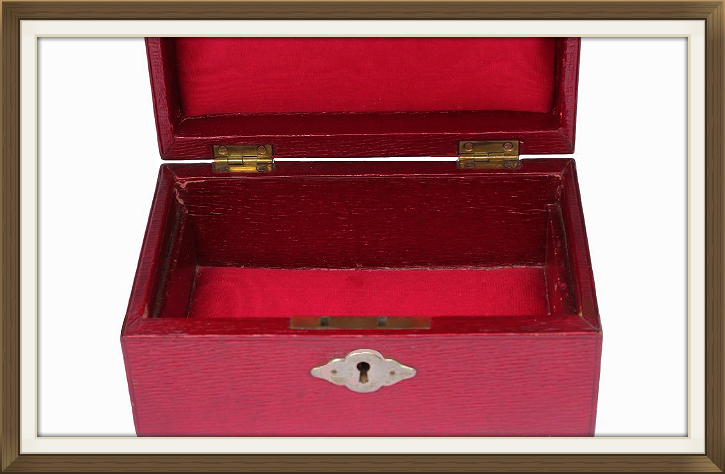 The side compartments are an ideal size for small pieces of jewellery such as brooches, earrings and pendants. Beneath the tray is a single large compartment. This will hold larger pieces of jewellery, such as bangles and watches. The walls of this compartment are lined with leather, matching that on the exterior. There are beautiful padded silk panels in both the bottom compartment and inside lid. This is high quality 'watered' silk, with a beautiful crimson shade and a lovely shimmer. 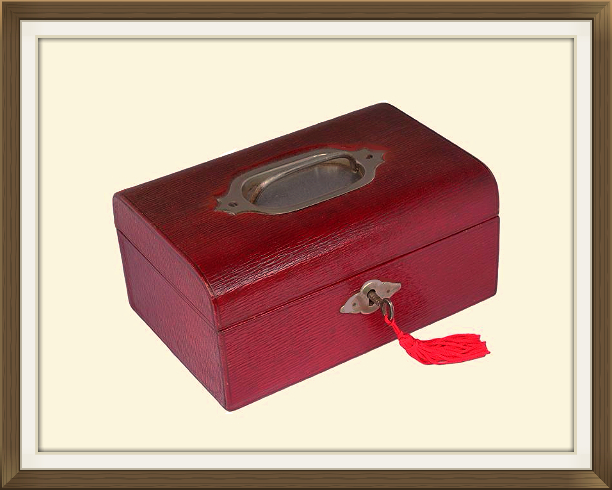 The box has its original leather covering on its base. It also has its original key and brass stop hinges. These prevent the lid from falling back. This box is in lovely condition overall. The leather has some light age related wear, and the back edge of the lid has faded a little. It will not lose any more colour if its kept away from strong sunlight. The beautiful velvet and satin linings are all in excellent condition! 6.5 by 4.1cm with a 2cm depth. 6.6 by 6.3cm with a 3.7cm diameter to the circular ring.